Can I stop my puppy barking at my children? Canine Behaviour Officer Kate Ellam says: Dogs can bark for a number of reasons. When it occurs in response to children, it can often be because they are worried or overexcited and wanting to play. In either scenario it’s important to ensure the safety of the children, while making sure your puppy feels comfortable and relaxed. To do this, try to prevent him from coming into close contact with children. For example, if this is happening in your home, use baby or stair gates to help separate the puppy from the children; if it is happening outside the home, try crossing the street, or avoid walking past areas where there will be lots of children, such as playgrounds and nursery schools. It is also important, if this is happening in your home, that your puppy has a safe space to go to where he will not be disturbed. This could be a bed in a quiet area of the house that the children cannot access. Try to keep enough distance between your puppy and any children he encounters so he does not feel the need to bark. You can start to reward your puppy with food for remaining in a calm state while he can see the children. 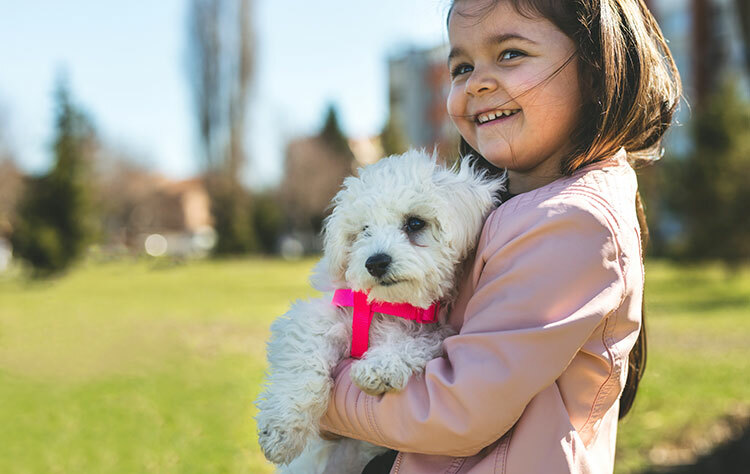 Over time, as you start to see more calm behaviour and less of a response to the children, you can gradually build up to your puppy being closer, following the same process of rewarding calm behaviour. It’s important that any children you encounter are not allowed to rush up to your puppy as this could frighten him or make him overexcited and will undo all the hard work you put in! Do not to use methods that your puppy might not like, such as spray collars or rattle cans, to try to stop the barking. These can often make the behaviour worse and can actually cause your puppy to feel worried and stressed. If the barking continues, it would be a good idea to seek professional help from both a vet and a suitably qualified behaviourist.